Many runners will say that running is enough exercise. Unfortunately, it is not true. Runners can benefit immensely from strength training. It helps develop the whole body in a balanced way such that you become a better and faster runner. The strength workout differs a bit from the usual weight training routine. Instead, the runner will aim to build endurance and explosiveness in the muscles. Body weight exercise routines are ideal for a runner as the muscles will learn to work with the weight they carry as you run. Here are some of the strength workouts to try out between runs. You start by propping yourself up with your elbows on the ground and the arms resting completely on the ground parallel to your body. The abdominal muscles should be tight, and shoulders directly above the elbows. Hold this position for 45 seconds to one minute and 3-5 reps which you can increase your core gets stronger. This exercise targets the core, shoulders and lower back. Start by raising your hands up straight and locking the elbows. Step forward with one leg and lower the body until the front knee is bent 90 degrees. Your back should remain straight. Hold this position for 5 seconds before returning to your original position. Repeat with the other leg for 6-10 reps. Hold up light dumbbells as you progress. This exercise works the shoulders, glutes, core, hamstrings and quadriceps. These are some of the most popular compound body weight exercises. 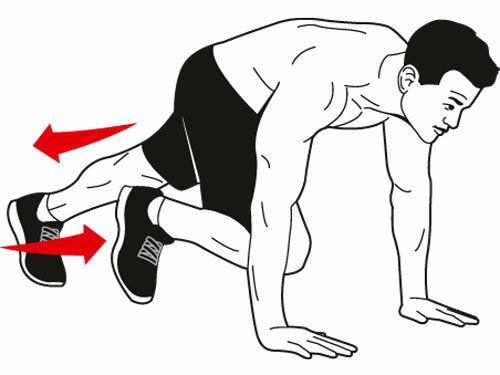 The basic form of the push up starts with lying on the ground with the chin, chest and knees all touching the ground. Place two hands on either side of the chest. Push up ensuring that the whole of your body rises uniformly. Start with 5 reps and build up in multiples of 5 as you progress. The push-up works the triceps, core, shoulders and arms. Get into a raised push-up position and maintain that stance. Bring your right knee in towards the chest then extend it back to the original position. Repeat with the other knee. Try to alternate as fast as you can. Start with 2-4 sets of 10 reps each. Ensure your lower back maintains a level posture. Mountain climbers work the shoulders, core, glutes and hamstrings. Lie flat on your back palms touching the ground, knees bent, arms out, and feet soles flat on the ground. Try to raise the hips off the floor as you dig into the ground with your feet. Go as high as you can, hold and contract your glutes, core and hamstrings. Hold for 3-5 seconds and 3 sets of 10 reps. Strength training between runs ensures all major muscles develop in a balanced manner such that you don’t suffer posture problems and injury. Hope you can use some of this information to help you with your daily running.